What do you mean both children need to come with me? If sometime in your first baby's toddler years, you looked at him or her and thought "Hmmm this one is cute, but getting big. I guess let's make another one, but smaller!" you may want to read this post. It turns out that just because your oldest can walk and declare things like "No help Mama!!" does not mean you can just leave them somewhere while you go off with your new baby. In fact, it means that you will be transporting both of them with you as you try and do previously simple tasks like dropping off the dry cleaning. 1. Your oldest is too old to ride in a stroller. 2. Your oldest is 2 going on 22 and has been going stroller free since she was 20 months because "strollers are for babies" (ask me how I came up with this one). 3. Thinking about attempting to get the double stroller through the door of the dry cleaner makes you hyperventilate. So what's an urban family with 2 hellions to do? This is the absolutely most genius idea ever, put out by the fine folks at Skip Hop. It is a Skip Hop Walk-Along Stroller Handle that attaches to the frame of your stroller for the toddler to hold. They come in a variety of colors so you can pick your toddler's favorite one. Ours is obsessed with owls so this was a major win for us. We have been enforcing strict hand holding with her ever since she was 12 months (not holding hands resulted in immediately being picked up, which for some blessed reason she thinks is punishment). 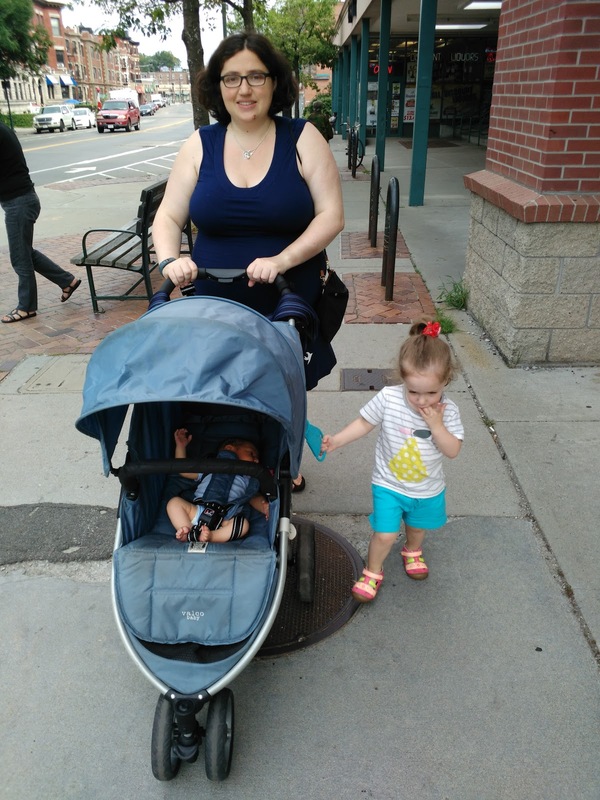 Thus, when the stroller came out of storage after the birth of our son it was easy to edit the previous "always hold hands rule" to a "always either hold hands or the owl" rule (she almost always prefers the owl handle). We've been happily using this for 3 months without any problems. Valco Hitch Hiker Ride On Board . This is a board that attaches to the back of your stroller that your child can ride on. Most stroller brands offer this as an add on. We have the Valco version because that is the brand of our stroller, though this attachment claims itself to be universal. Looking at the construction, I would guess it probably can attach to most strollers if you're willing to apply some muscle. Additionally, what's great about the design is that the board slides into braces that you attach to the stroller. This means that once you attach the braces, you can take the board itself on and off relatively easily (figuring out where to put the braces and then securing them can take a bit of both brain and brawn, so it's nice to only have to do this once). In the spirit of full disclosure, there are 2 downsides to using this board (or almost certainly any one like it). If you have to bounce up the stairs backwards with your stroller in your daily life (like we do to get into our building), bouncing with the board attached can be a hassle. Also, admittedly acquiring this piece of hardware can seem a bit pricey but there are a couple of things to consider such as the fact that this is definitely cheaper than a double stroller. And with that, you're ready to go off on your adventures, be they near or far!